A cheap price for potent range .44 Remington Magnum ammo with a semi jacketed 240 grain hollow point complete with a lead nose and great accuracy. 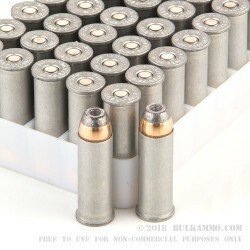 The one caveat to this round, is that those who like to reload may not approve of the non-reloadable aluminum cartridge casing that forms the basis for the line. 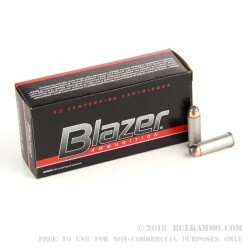 The Blazer line up is a proven product in the CCI portfolio and offers an inexpensive opportunity for those who prefer not to pick up or reload brass casings to shoot their firearms in a high volume way without having the same financial sting as other mainstream ammunition offerings. Alliant Tech Systems has made great inroads into the shooting community as it took over the CCI brand and continued to move the budget friendly producer into the mainstream. 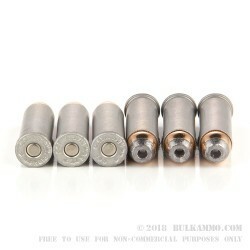 The substantial ballistics of the .44 Magnum cartridge means this is easily used as a self-defense round in any number of firearms, with the aluminum casing being quite amenable to different designs while feeding and functioning reliably in a wide array of firearms. Offering 1200 feet per second velocity and 767 ft. lbs. of energy at the muzzle makes this a very potent cartridge.